The College Woods Natural Area. This 64-acre tract, once the woodlot of Benjamin Thompson, will be left undisturbed for the study and enjoyment of present and future generations. College Woods is located on the west side of the main campus. It comprises approximately 250 acres of woods, streams, and small fields. College Woods is the oldest and most intensively used University property for education, research and recreation. It is not uncommon to see walkers, runners, and classes all in one brief stroll through the woods. The original land was donated by Benjamin Thompson, Jr. to New Hampshire College of Agriculture and the Mechanical Arts (the predecessor to the University of New Hampshire) via his will in 1891. This donation was part of the original gift that moved the College to Durham from Hanover where the College was connected to Dartmouth College. All of College Woods has been cut at least once. Wood from these areas was used to build some of the earlier college's structures. Most of these building no longer exist. Nevertheless, in some instances, the woodlots that provided this wood still do. One building containing timber from College Woods is Morrill Hall, constructed in 1903. The woods have been encroached upon by University building expansion since it was donated to the College. In 1933 the University, in conjunction with the town cut out a large portion of College Woods for the Oyster River Reservoir. This was done because of a need for a bigger water supply. It is alleged that some of Ben Thompson's largest trees were cut at this time. Although some smaller harvests have occurred just south of Channel 11 and between Mill Road and the reservoir, the last major operation was the salvage of timber from within the Natural Area immediately following the hurricane of 1938. 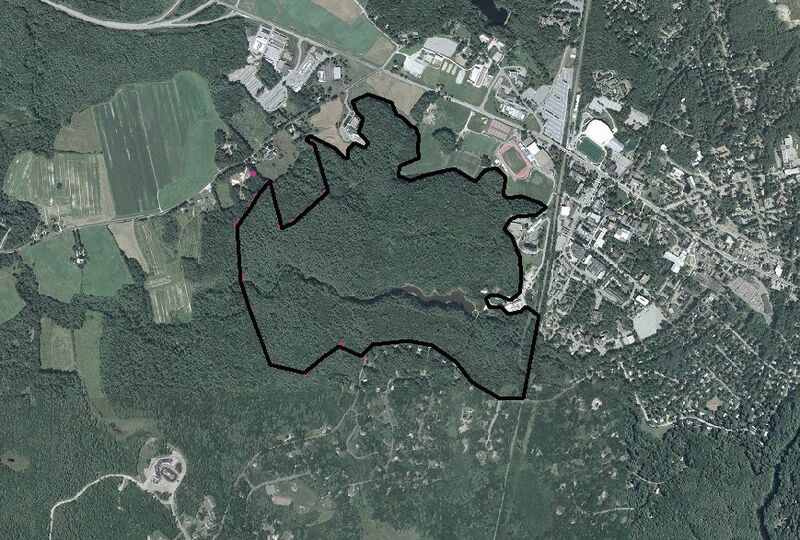 Presently, some 60 acres within the main woods area is designated as a Natural Area. This designation places these stands in a preservation status. This area was designated in 1961. Since this time nothing has been done to alter natural process within the Natural Area. Dead or dying trees have only been removed when they pose a hazard to trail traffic and safety. From Pettee Hall, walk down Colovos Road and under the railroad trestle. Then take a left, walk along the road until you reach a fork in the road. Look off the road to the right and there is a path (behind the center field fence) this is the beginning of College Woods.